Regardless of whether you winterized and covered an above or in ground swimming pool or a spa tub, used a flexible or automated solid pool cover, you want to make sure you keep the pool cover free of excess water and debris. Failing to do so will not just look ugly but greatly reduce the lifespan of your expensive cover. There are a handful of pool cover pumps available but not all live up to expectations. Pool owners are often frustrated when an expensive pump fails after a short time. Others want to make the switch from manual pumps to automated but aren’t sure which one to go for. 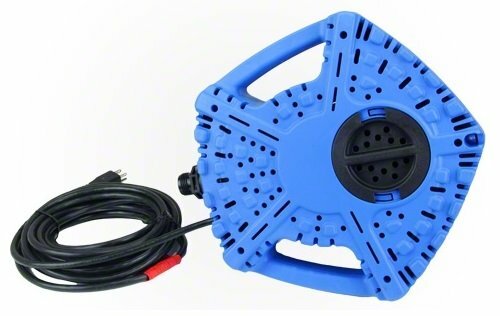 This review looks at the Little Giant APCP-1700, an automated pool cover pump that has proven to be a very reliable a valuable piece of winterizing kit. How much water does it leave before turning off? Will it be too heavy on an in ground pool cover that is secured by 4X4′ timber and bricks or waterbags? How does the pump handle leaves? How do I safely get such a heavy pound pump to the center of a cover? Is this pump ok to freeze/thaw temperatures? Will it stop automatically when the water is drained ? Is this pump fully submersible? People often buy this after their previous pool cover pump of a different make has died much sooner than expected. The APCP-1700 offers high quality at this price. It is being used everywhere where there is a need to drain water out of the pool when it rains or have a melting snow situation. It certainly does well in frequent freeze/thaw regions in the winter. This pump doesn’t clog up and on the rare occasions that it does it can be easily cleaned. It’s popular on different kinds of pool covers: on above ground intex pools, in ground pools with tarp or automated covers, salt water in-ground pools on mesh cover and spas, even sitting on the second step to keep water levels in check. Pump rate is impressive. It does pump a lot of water and does so very quietly. It is designed to do well when submerged. To give you an idea how quickly it pumps imagine a 6″ of rainwater on a 50’x25′ electric automatic roll-up pool cover, and this pump w/ a 15′ garden hose attached to it,evacuated all the water in about 3.5 hours, leaving just a thin layer of water that is no problem to open the cover. It’s great not having to worry about switching it on and off. 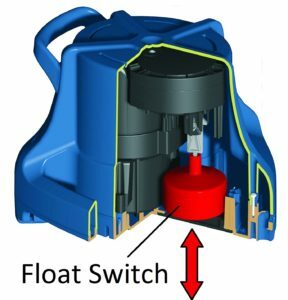 The integrated float switch operates very reliably and turns the pump on or off when the water level reaches about 2”. This pump weighs in at a solid 12lb. Despite the weight it’s easy to transport around thanks to the built in handle. Most people find it easy to put this on their pool cover and move to the right spot – see video below. When it is sat on a pool cover it stays upright and doesn’t fall over. Some above ground pool covers might be an exception when sagging so much causing the pump to tip over when angled too much. A solution could be to find a crate or similar for the pump to sit in and have a wider base. Usually though, it sits like a rock. Users also like that it doesn’t have rusting parts that would stain a pool cover and a standard 3/4“ hose can easily be connected to, no custom parts requiring special accessories. The video shows how to set up and position the pump on an automatic pool cover. 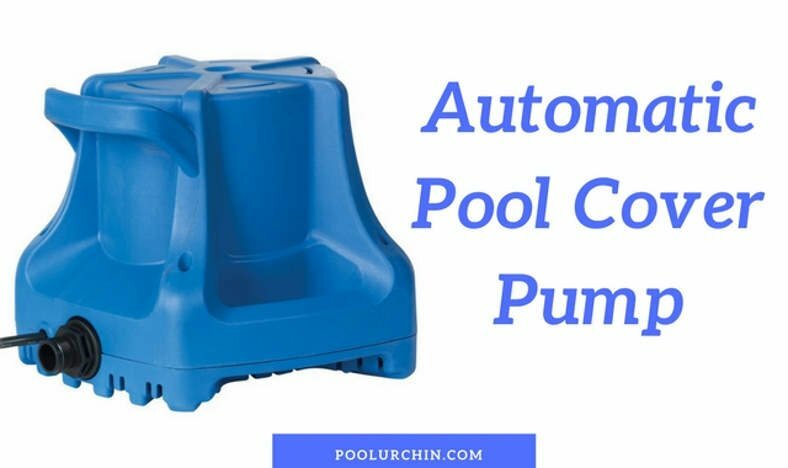 Type: Automatic Pool cover pump Automatic means the pump switches ON/OFF depending on the water level. The pump can be set and forget and will operate when needed. No supervision required. 3/4-inch garden hose connection A 3/4 inch is the most common diameter for garden hoses. No extra fittings required. Sideways discharge The output on the side greatly reduces the chance of kinks in the discharge hose. .6234 = 319) in 1 hour, in 1″ per hour rain. 25 foot cord Counts as an extended cord, for easy household use. The pump is set to switch off when the water level has reached .50″-1.50″. This means it leaves only very little water on tarp covers as the pump sits in a little valley due to its weight. It pumps enough water away to make opening the pool a cinch. On solid automated pool covers enough water is drained to let the rest of the water on the cover be pushed out when opening the pool. Even though this pump ways in at a quite hefty 12lbs you should be fine. Many users have reported they are using the pump successfully on a pool cover secured by waterbags. Lots of leaves will be sucked towards the pump. Eventually this will reduce the flow of water quite considerably although the pump itself is know for doing a good job of NOT clogging up because the holes in the bottom screen most of the debris. If there are many leaves to deal with you could place the pump into a crate or vessel with holes in to keep the leaves away from the pump but let water in. Get the pump ready by attaching the discharge hose. To make handling easier attach a rope on the handle. The rope should be long enough to reach the opposite end of the pool. Place the pump on edge of pool then use rope, hose and electric cord to pull pump to where you want it to be, ideally with two people. You will find that the pump slides quite easily despite its weight. 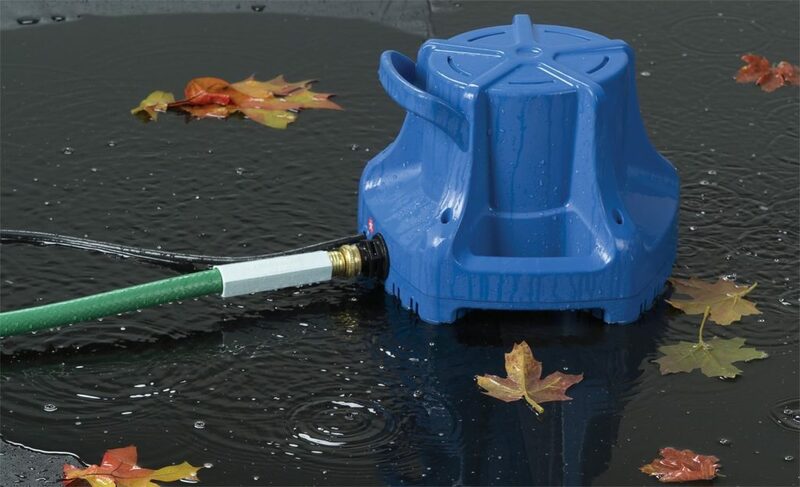 For shorter distances you could use the rubber end of a pool brush pole to guide the pump where you want it to sit. Even though there are plenty of reports where users have let their pump run through the winter with no problem, it is not recommended to let the pump run in freezing conditions. Not so much because the pump doesn’t work but because the discharge hose will freeze up with ice. When the pump keeps running under these conditions it will burn out. Yes, the built in float switch causes the pump to start when water levels reach about 2″ and to stop when the water is down to about half to 1.50″. A great set and forget feature. Yes, it is perfectly fine to use when fully submerged. Best Buy automatic pool cover pump. An automated, set and forget pool cover pump that can remove water quickly and is certainly well suited for larger pool covers. It has proven to be reliable, durable and spare parts are readily available. A 3 year warranty adds extra peace of mind. If this is not the pump you want or need, please check out our article on the best pool cover pumps, we hope you will find what you are looking for in there. This entry was posted in Pool Cover Pump on December 18, 2017 by Pool Urchin.